The launch of Shenzhou-5 on a Long March 2F rocket (Credits: AAxanderr/Wikipedia). Where is China headed in space? It’s a question that’s being asked more often than ever before. We have witnessed the launch of China’s first space laboratory in the same year that the USA has retired its space shuttle fleet. In 2012, China is expected to launch two teams of astronauts to the Tiangong-1 laboratory, while the US will continue to hitch rides aboard Russian spacecraft for years to come. China has a long way to go before it can truly match the spaceflight capabilities of the US, and its technology base in robotic spaceflight still lags other nations. But it’s a solid program that’s moving ahead at a steady pace, while some other nations seem to be in retreat. China has outlined its human spaceflight plans for the near future. The Tiangong program will see three space laboratories placed in orbit this decade. Each one is expected to be more sophisticated than the last. The final laboratory, Tiangong-3, is expected to be a major step forward, and should be capable of receiving multiple spacecraft dockings. Tiangong is a precursor for the ultimate short-term goal, a large modular space station that should be launched around the year 2020. Although this will not match the capabilities of the International Space Station, it will probably exceed the performance of the Russian Mir space station of the last century. China is also working on an ambitious lunar and planetary program. 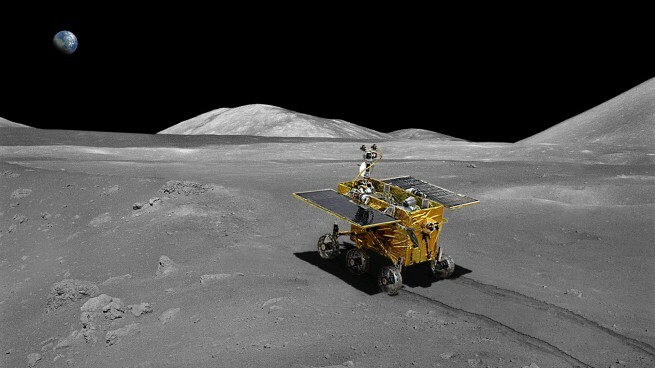 Following in the wake of two successful lunar orbiters, China will land its first spacecraft on the Moon around 2013, and deploy a small robot rover. We can expect a repeat of this mission a year or two later, followed by the next major flight around 2017, when a robotic sample-return mission will land. There will probably be a sequel to this mission too. China lost its first Mars probe, Yinghuo-1, when the Russian Phobos-Grunt mission failed to leave Earth orbit in November. 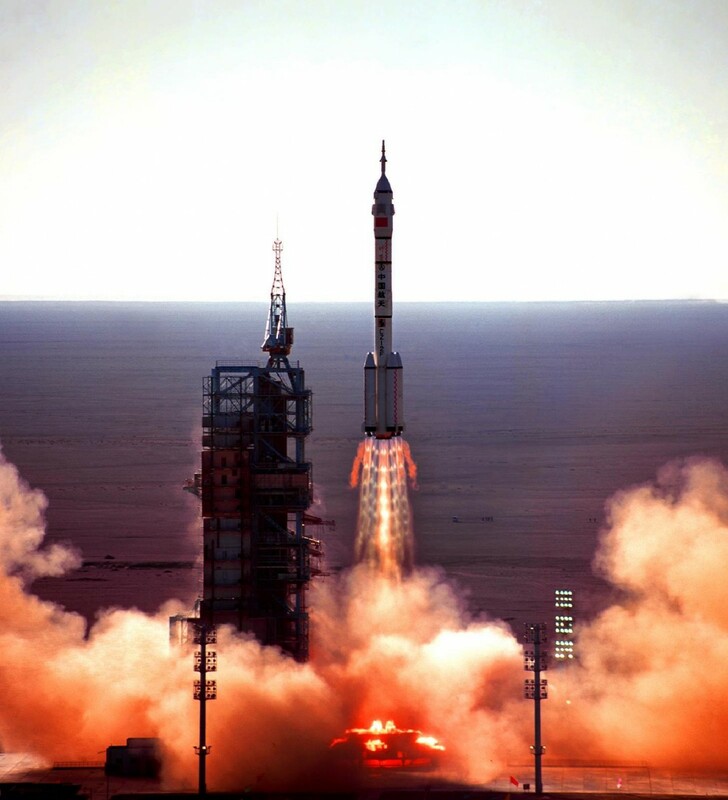 But China is already planning more ambitious missions to Mars that will be launched by Chinese rockets. China is also continuing its strong programs in Earth Observation (often with international partners), as well as navigation and communications satellites. That’s what we can expect for the decade ahead. Beyond 2020, the agenda is less certain. But there’s one important factor to notice in China’s space program. It’s very strong on building foundations. China has a long history of international cooperation in spaceflight, but it retains control over the most critical elements of its program. China builds and operates its own launch sites, launch vehicles, human spacecraft, space laboratory modules and satellites. These are the foundations of a first-rate space program. Without them, a nation is not completely in control of its destiny in space. There’s a lesson for America and other nations, even those that work in solid international coalitions for spaceflight. The loss or omission of any of these basic foundations is potentially catastrophic, and can place an entire program in jeopardy. The current lack of any indigenous US crew transfer vehicle is shocking, especially when America seeks to continue its major role in the International Space Station. China’s autonomous approach to the foundations of its program places it in an enviable position. It does not need to wrestle with cumbersome international partnerships, but can still gain from other programs when there’s a clear advantage. 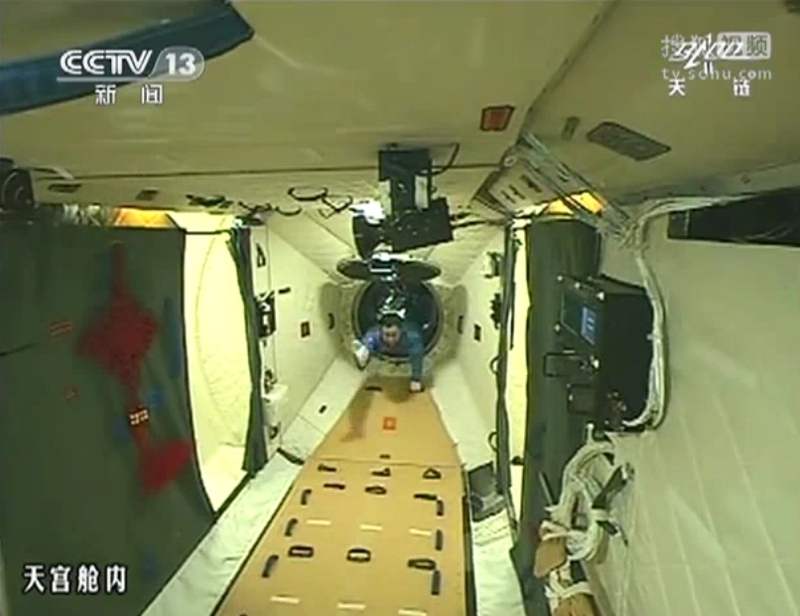 Shenzhou-9 commander Jing Haipeng, the first human to board Tiangong-1 (Credits: CNTV). China is developing a new spaceport at Wenchang on Hainan Island, which will be the nation’s most southern launch site. This will allow rockets to gain a greater kick from the Earth’s rotation, and also allow the spaceport to be serviced by sea. Wenchang will continue to be supplemented by other major launch sites such as Xichang and Jiuquan, which carry out the bulk of China’s satellite launches. Wenchang will play host to China’s most ambitious plans in rocketry to date. The gradual development of the Long March 5 series of modular launch vehicles is another major foundation for China’s long-term program. Flying from Wenchang, these rockets will be used to launch China’s space station and send larger probes to the Moon and the planets. Launch systems are the first step in any space mission, and a lack of capability is an obvious problem. China’s pursuit of advanced rockets gives them the option to pursue a variety of different objectives in space. It is probably fair to say that, behind closed doors, China is already considering how to send astronauts to the Moon. This could be done with an Earth Orbit Rendezvous strategy. A Shenzhou spacecraft could dock in Earth orbit with another rocket stage, possibly launched by a Long March 5 rocket. This would then propel Shenzhou on a circumlunar flight, or possibly an orbital mission. Eventually, it should be possible for Chinese astronauts to land on the surface. The logo of China’s Lunar Exploration Program features two human footprints on the Moon. Despite these clues some people still deny that China aspires to human lunar missions! The Chinese National Space Administration successfully soft-landed the Chang’e 3 lander with the Yutu rover on the Moon December 14, 2013 at 8:11 a.m. EST (1311 GMT), within Sinus Iridum, or the “Bay of Rainbows.” (Credits: ESA / CSNA). The most difficult question centers around China’s potential partnership with the US. This is a complex and controversial issue. Right now, there’s simply no chance of any serious cooperation. Any change in this will depend on politics, strategic issues, economics, and the overall direction of spaceflight. It seems unrealistic to expect that the two programs will remain totally disengaged forever, but bridging the gap will take time and a lot of work. China’s astronaut corps remains off limits to foreigners for the moment, but there’s a good chance that guest astronauts will eventually fly to China’s space station. Where will they come from? It is conceivable that China will invite astronauts from closely allied nations such as Pakistan, and possibly from nearby states in Asia. The recent successful docking of the Tiangong-1 space laboratory with the uncrewed Shenzhou-8 spacecraft focused global attention on China’s space program, showing that China has so much to demonstrate to the world. Sadly, China’s obsession with secrecy for much of its space program has hamstrung much of its potential appeal. It has contributed to fears and suspicions of Chinese spaceflight. China’s relative lack of openness is also a major barrier to any future cooperation with the US. Opening the program to wider examination would certainly help the Chinese, as well as the world at large: it would make a great space program not only look better, but actually mature and become even greater. Dr. Morris Jones is an Australian spaceflight analyst and writer and a regular contributor to Space Safety Magazine. Opinions expressed are those of the author and do not necessarily reflect the views of Space Safety Magazine or its sponsors.